If there’s an electrical problem on your motorcycle, stay patient and use logic. You’ll just need to get yourself a good ohmmeter/multimeter to track down what needs repair or replacement. This page will serve as a starting guide to get you started troubleshooting electrical problems on your motorcycle. Ohmmeters/multimeters have a setting to measure the resistance between wires and electrical components. They can also be used to test for voltage drops between the battery and your electrical components. You can refer to your shop manual for the exact resistance measurements you can expect to find in properly working parts. Before you start doing any electrical testing, make sure your battery is fresh and fully charged. It can also help to clean all of your motorcycle’s connections with electrical contact cleaner. An easy test for electrical issues is to check the continuity between two ends of a wire or between wires that are supposed to be connected. If your motorcycle is equipped with an electric start button, then it relies on a starter motor to crank the engine and start the bike. Sometimes, you’ll find that nothing happens when you hit the starter button. Unfortunately, it could be a number of things within the electric starter circuit. This page will help you track down your issues. First, always make sure the battery is in good condition and charged. The starter motor can draw a lot of power, and if the battery is too low, it probably won’t start. Next, check the starter solenoid. This is the short, round component that typically sits near your battery try. 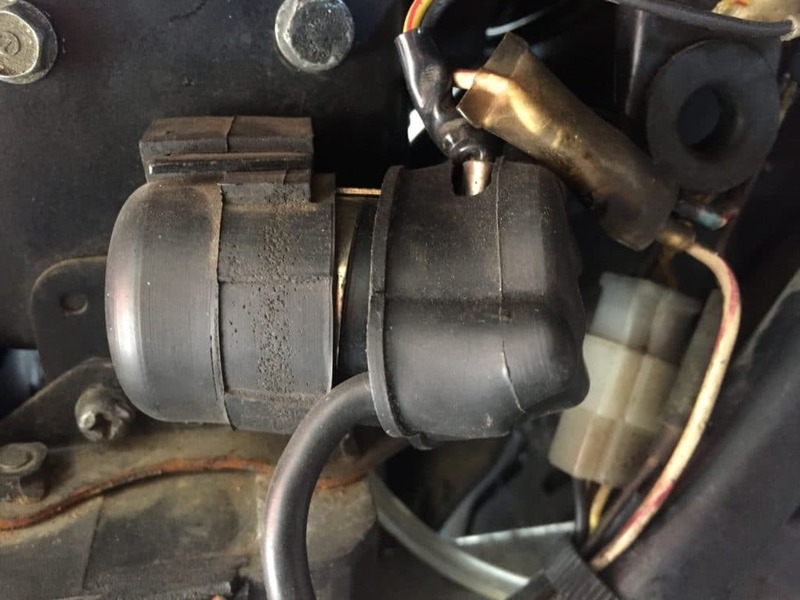 There will be two posts, one that connects to the battery positive terminal and the other that connects to the starter motor with a thick wire. If the solenoid clicks when you hit the starter button, but nothing happens, it could be damaged on the inside. You can bypass the solenoid by bridging the posts with a screwdriver. This will cause sparks, so be careful. If nothing happens, when you bridge the posts, the starter could be the issue. To test the starter, you can connect a jumper cable from the positive terminal of the battery to the positive post of the starter motor. If it works, there is likely an issue with the large cable the connects the starter to the solenoid and/or the solenoid itself. It may also be that the starter button housing is corroded and it is not getting a solid ground when it is depressed. Remove the right hand controls to check. 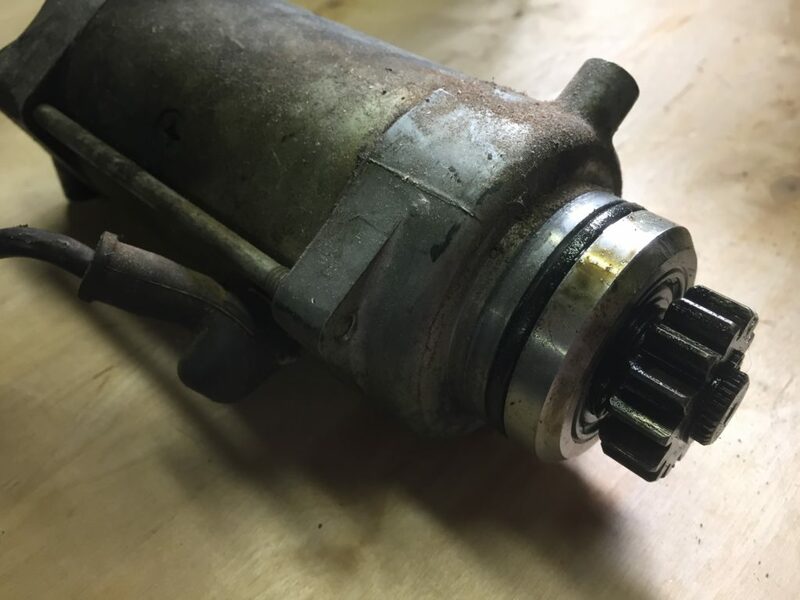 If your starter motor is the issue, you’ll need to take it out to service it. There are typically held in place by two long bolts. Depending on the design of your engine, you may need to remove a side cover to get to it. Once the starter motor is out of the engine, you can unscrew the two long screws to start to take it apart. Take it apart slowly, as there are small pieces that fit together in a sequence on the inside of the motor. Sometimes a good cleaning is all it takes to get your starter motor working again. Overtime, o-rings and seals can break down, which allows oil and grime to enter the starter motor and foul things up. Clean out any carbon buildup and oil. Replace your old rubber seals and o-rings with new ones. If you can’t clean your carbon brushes or they’re too worn, replace them with the ones in your starter motor rebuild kit. Aftermarket kits may require some minor modification for them to fit properly. To test your ignition coils, start by measuring the resistance between its primary wire that runs to the ignition points or electronic ignition and the ground/ground terminal. The reading should be between .5 to 1.5 Ohms. Next test the resistance between the spark plug wire and the ground. The reading should be around between 6,000 and 13,000 Ohms. Be sure to take the spark plug cap off when testing as the caps add resistance. Refer to your manual for the exact resistance specifications. The stator is part of your motorcycle’s charging system. It looks like a round, woven coil of wires, and it sits around the magnets on the flywheel. There are typically 3 wires of the same color and a ground wire that come from the stator. Measure the continuity/resistance between the wires of the same color. It should be between around .5 to 3 Ohms. There should be no continuity between the three wires and the ground wire. Refer to your shop manual for the exact specs. The motorcycle’s rectifier is another part of the charging system. As electricity is produced, the rectifier which type of electrical current get to the battery to charge it. To test the rectifier, connect your Ohmmeter to one of the wires and the ground/mounting stud of the rectifier and record the reading. Next, reverse the leads of the Ohmmeter and check the readings again. The two reading should be very different. Repeat for all wires. If any one of them has a reading that is too close or if there is not continuity, the rectifier may be bad. The voltage regulator controls how much current gets to the battery so that it doesn’t overcharge. To check that it’s working properly, set a multimeter to the 20 volts DC range and connect the positive and negative leads to the positive and negative leads on your batter. As you rev the engine, the volt reading should get up to around 14 volts. If it’s more than than, the battery will overcharge. If it’s too much less, the battery won’t charge at all. Some old regulators can be opened up, cleaned, and adjusted if they are not working correctly. You can measure voltage drops in your wiring harness and electrical system by connecting the positive lead of a multimeter to the positive lead of a battery and the negative lead to the component of wire you want to test. Be sure the multimeter is set to a DC range above 12 volts. If the reading is 12.6 volts, there is no voltage drop between the leads. If the reading is less than 12.6 volts, then there is a voltage drop somewhere. A voltage drop indicates resistance in the circuit, which means the wire or the component may need servicing or replacing.